Had some Thomas Handy last night. I must say, it was very impressive. Looking forward to trying the others. I concur with Woodford Reserve. This may be sacrilege, but I enjoy it with Diet Dr Pepper! I'm new to the bourbon game. I've only tried Maker's Mark (It was a Halloween party and I was too sauced to taste any of it), Jim Beam (No thanks), and Wild Turkey Rare Breed. The Rare Breed, at 108.2 proof was a bit too strong to sip straight, but mix it with a coke zero and you've got my new favorite mixed drink. What would you recommend for me to try for under $40? I'd like to pick up a bottle on payday next week, and I want to try something new, but I'm in school, paying off a car, and trying to only work 25 hours a week, so it really can't break the bank. Any suggestions? Let me know what you end up grabbing and what you think of it. I know they've got Woodford at the local Liquor store, maybe I'll start off with a bottle of that. I'll definitely report back. I wasn't a fan of whiskey until I tried bourbon, and I'm quite excited about it! IMHO there is no better deal for the $ then Bulleit. After that I go for Woodford. I think they have Bulleit there too. I'm heading there in a bit, and the price will make my mind as to which I'll be trying tonight. I will most definitely be posting back here with my review. My choice would be Woodford Reserve or Knob Creek. I have a big bottle of Eagle Rare 10 which is good, but I really like the Evan Williams Single Barrel Vintage 1997, it has some of most amazing flavors at a great price. I think I'll pour myself another Knob Creek while I'm up. I finally branched away from Knob Creek last time I was at the liquor store and picked up some Woodford. I'm glad I did. Not quite as smooth as Knob, but more in depth and more flavors. Went to the liquor store yesterday, and between the Woodford Reserve and the Bulleit I couldn't decide. 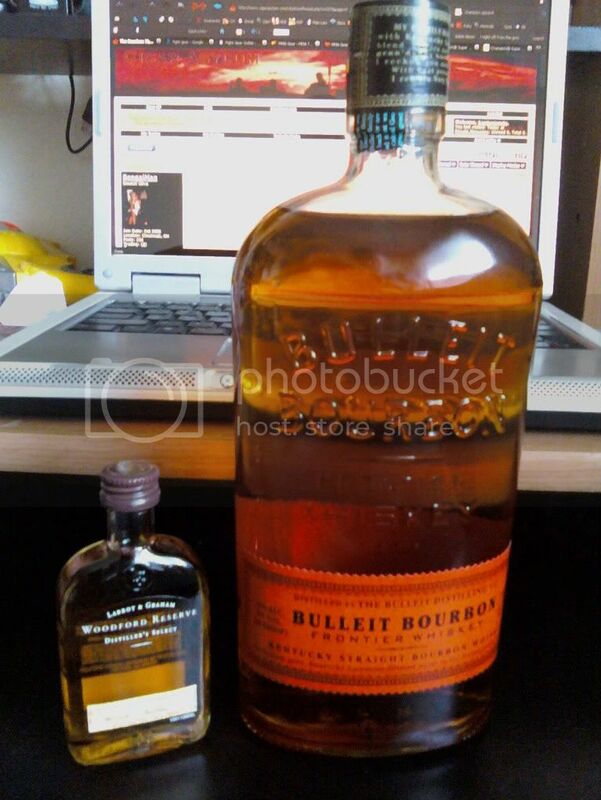 I let the $8 difference in price dictate, so I grabbed the bottle of Bulleit. Luckily, at the register they had a few of the 50ml bottles of Woodford so I bought 2 of them. My roommmate grabbed a fifth of Fighting ****. After an extensive tasting ceremony, I've decided I like the Bulleit better with a coke, as it's got a bit more burn. The Woodford had a sweet character, and I thought I tasted some vanilla/caramel (Although with liquor I have virtually no palate. I'm not accustomed enough to the alcohol burn yet to detect more delicate flavors like I can with cigars). I've decided that Woodford Reserve has officially become my new sipping liquor (The only one, I might add, that isn't a tequila), but I didn't like it in the Coke, as the sweetness was lost in the mix. That fighting **** is some savage stuff. It had a serious burn, which I like for mixing in a coke. Next on my try list is Knob Creek, and when I sell my books back at the end of the quarter, I'll grab a bottle of Booker's to bring in the Winter break right. This is really cool, as I've never been a huge whiskey fan, but I'm really starting to enjoy this Bourbon game. Any other recommendations for sub $50 fifths worth trying? One great thing about bourbon, besides bleeding from the rolling hills in the bluegrass, is that there is a selection of good bottles for just one $20. I wish I had more people around me that liked bourbon so we could do blind tastings. It is pretty Damn good. Throw some of MCS's Dr. Pepper into it. This is really cool, as I've never been a huge whiskey fan, but I'm really starting to enjoy this Bourbon game. Any other recommendations for sub $50 fifths worth trying? I really like where your palate is headed. The woodford is a bourbon i would never mix, only sip. The bulleit is not bad for sipping, but not so good i wouldn't feel bad mixing it. Keep the fighting ck for giving to people who just want to get drunk. The knob creek and bookers are excellent to sip, just add one or two ice cubes to cut the high alcohol levels. you are on yet another wonderful slope. That fighting **** is some savage stuff. Fighting **** is some rough stuff and right at the same price as Beam. There's a handfull or two that are cheaper and better. Any other recommendations for sub $50 fifths worth trying?